Hot on the heels of returning home from our honeymoon trip to Amelia Island and Destin, Florida, it was time to celebrate my birthday. I’m one of those crazy people who believes that birthdays should be celebrated with great pomp and circumstance. As far as I’m concerned, the whole being born thing is no small feat and as such, anniversaries of that event should be special. I’ve met many ill-informed people who say such things as, “It’s just another birthday.” Those people are wrong. It’s an event, and an important one. Having spent a year and a half fully indoctrinating my better half in my beliefs surrounding birthdays and their proper celebratory practices, I had no doubt that she was planning something special. In general, I like to spend a few days away someplace special to celebrate a birthday. In recent history, that had not been possible due to my employment and the fact that I worked every single Saturday without exception. Never having two consecutive days off put a damper on these events. However, immediately upon returning from our honeymoon, I was given an answer to prayer. From out of nowhere, the circumstances in my life were being altered again. Changes were being made at my place of employment. They were not changes that I wished to make. Because I had been earnestly praying for months for new doors to be opened to me, I saw this as God stepping into the fray and telling me that my prayer was being answered. It was time for me to take a leap of faith and make my own change. And so suddenly, here we were with time that we didn’t have only days earlier. Out of the blue, we had the opportunity to spend a weekend away for my birthday, and so, without me knowing where we were going at the time, it was off to Chattanooga! No doubt you’re on the edge of your seats, so: get in, sit down, shut up and hold on! We left early in the morning. They say all’s fair in love and war. I had asked my wife to get up at 3:00 AM twice on our honeymoon, so her telling me that we were to leave at 7:00 AM was, I suppose, fair. The drive to Chattanooga is not actually a terribly long one. It’s only about two hours from where we live, directly southeast of Nashville on U.S. Highway 24. And it’s a beautiful drive. Especially as you get deeper into the molehills of Tennessee–what Tennesseans would inaccurately call mountains. Chattanooga and the area surrounding the town really are quite beautiful. And should I end up staying for any considerable length of time in Tennessee, I should like to move here or possibly to the Knoxville area. I am not a fan of middle Tennessee because it is so flat. But east Tennessee is completely different. 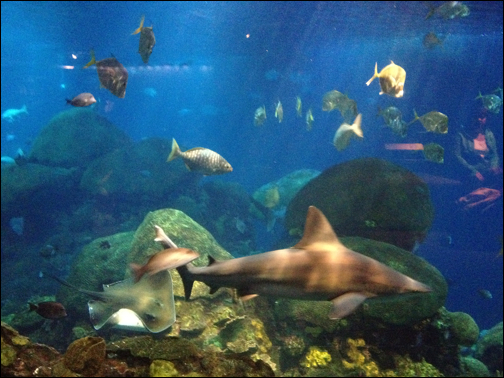 Our first stop when we arrived in Chattanooga was the Tennessee Aquarium. Actually, that’s not true. Our first stop was at Walmart, but right after that we went straight to the Aquarium. I had been wanting to visit this aquarium. 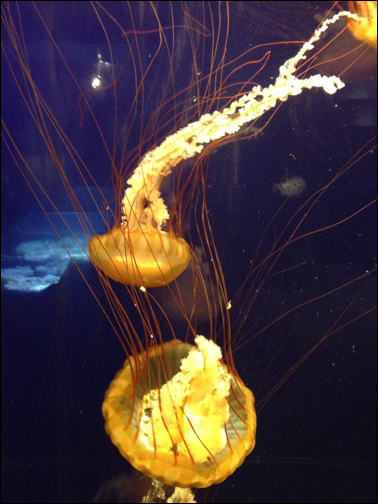 I love aquariums and I make a point to visit any that I come across. I’ve visited aquariums in Colorado, Tennessee (there are at least two here), Hawaii, Nevada, Florida and California, among others, and I can honestly say that Chattanooga’s aquarium is one of the best I’ve seen. As with most aquariums, it is overpriced. It will cost two adults about fifty dollars for admittance, but when you see where your fifty dollars has gone, you may find that the stinging pain in your wallet is eased a bit. Suffice it to say, they put a lot of money into the development of this place. 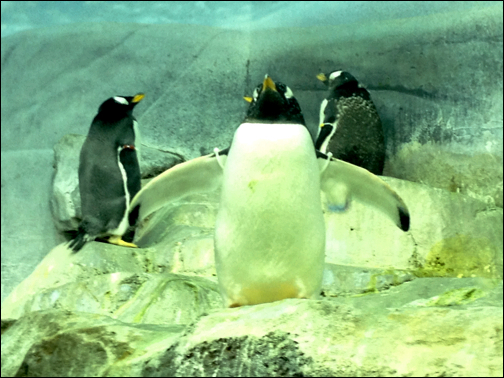 First up was the penguin tank, arguably everyone’s favorite exhibit at an aquarium. 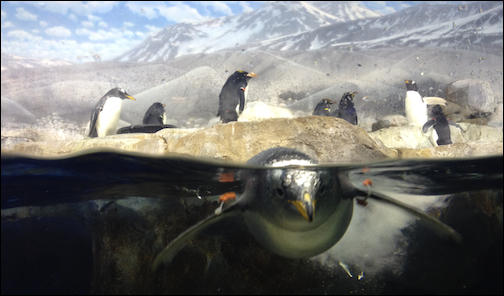 How can anyone not like a penguin? They look like bowling pins with fins! This particular penguin seemed to have a bit of a god-complex. I lovingly called him “OGG! The Great and Powerful!” He stayed in this position and didn’t budge no matter what making it easy to photograph him. Next up was the big tank. 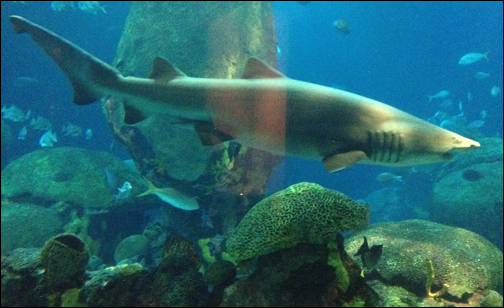 Every aquarium has one: A central tank that holds the most impressive fish and is the center of attention. The Tennessee Aquarium’s main attraction is simply monstrous. It is several stories high and winds its way through the entire aquarium. When you think you’ve seen the last of it, you’re wrong. You’ll see it again just around that corner or just beyond the next level. It’s huge and so are its inhabitants. That’s a stingray just behind the nasty looking shark. I’m told that the sharks are so well fed that the other fish and the divers that feed them need not worry about being included on the menu. Perhaps so, but I’d still be very, very nervous if I were any of those fish. I do not like sharks. And I don’t care how many people tell me how great they are. I think they are vile creatures. The big tank contained a healthy number of them. Even behind all that glass, I still felt all twitchy at the sight. How About a Peanut Butter and Jelly Sandwich? 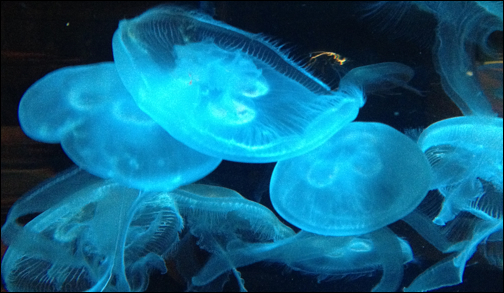 Every commercial aquarium has jellyfish. But the Tennessee Aquarium has gone all out here. I have never seen so many jellyfish in my life and I had no idea that there were so many varieties. If you ever said to yourself: “I wonder where I can go to learn all I possibly can about jellyfish and see as many varieties as possible in under fifteen minutes,” then you’ve come to the right place. And if you haven’t said that, you should. Out loud. In a grocery store. In the produce section. When all the soccer moms are watching. Really. Try it. I dare you. I double dog dare you. They look like harmless clouds floating in the water, but be careful, they carry a powerful sting and some can actually be fatal to humans innocently wading in shallow water. It’s hip to be upside down: These strange looking creatures are called Upside Down Jellyfish, because, well, they swim upside down. 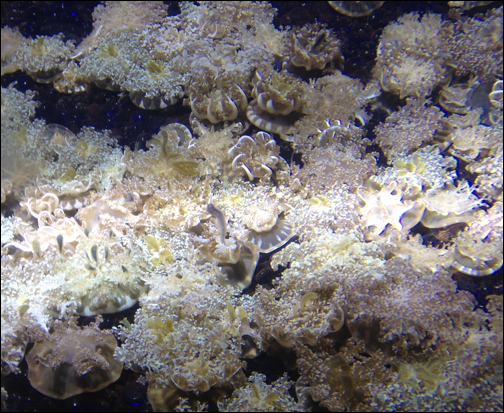 If you look closely, their tentacles are pointing upwards unlike other jellies which swim generally right-side up. This is a Sea Nettle Jellyfish. From what I learned, if you are a small crustacean, you’ll want to avoid these guys. Frankly, I would advise avoiding them regardless of your species. They sure are pretty to look at, but you wouldn’t want to be stung. Having just seen the Upside Down Jellyfish and learning that only Upside Down Jellyfish swim upside down, I was confused that the Sea Nettles were also swimming upside down. There are few things in the world as cute as a seahorse and the Tennessee Aquarium has plenty of them. I was disappointed to learn on Wikipedia that seahorses are not actually horses, but are in fact fish. So, in truth, they are horrible, marauding, murderous horse sea monsters! Naw, I don’t buy it either. They’re too cute to maraud anything. Can you find the two seahorses in this picture? One is swimming. One is just hanging out. Just chillin’ on a Saturday at the aquarium. This is not a seahorse. This is a seadragon. According to Wikipedia, however, it is from the same family as the seahorse. So, it actually is a seahorse. Since it is called a “seadragon,” perhaps this is how the seahorse acquired the scary “horse sea monster” moniker. …absolutely nothing will happen. Nothing at all. I tried. I didn’t get my wish. Jiminy Cricket is a two-timing liar, liar, pants on fire. That explains a lot. Never mind. According to Wikipedia, they can live as deep as 20,000 feet under the ocean. Even without wish granting properties, I like starfish. They are cute in their own suckerfish like way. In fact, I like them so much that I have a dead one on my bookshelf which I brought home from Destin, Florida. Once you finish touring the “Ocean Journey” side of the aquarium, you have the option to tour the “River Journey.” It’s the same as “Ocean Journey,” except that it doesn’t have anything to do with the ocean. I personally was bored by this side of the aquarium, but I’m quite certain that many patrons thoroughly enjoy it, and you might too. The only thing I really wanted to see here were the otters, but there were none to be found. We went to the tank that said “River Otters” on it. We looked in the water. We looked outside of the water. We looked at the rocks. We looked at the tree limbs. The otters were apparently off visiting their beaver friends someplace. I was…displeased. In spite of the otters not attending the party, there were some cute critters and some fish that were absolutely gargantuan. There were also a few alligators and ridiculously large and ugly snakes. I didn’t take pictures of those things. I don’t take pictures of things that can eat me. Except, apparently, for sharks. The turtles were the most delightful part of the River Journey. They’re cute. They can’t eat me and they make me laugh. Try as he might, the larger turtle here simply could not shake the smaller turtle. The little guy endlessly harassed the larger of the two. It was a hilarious spectacle. Back to the god complex. This turtle was very self-assured. While there were no actual bullfrogs to be found at the Tennessee Aquarium (they were hanging out with the river otters and their beaver friends apparently), there were plenty of frogs, including the Yellow-banded Poison Dart Frog. These are not bullfrogs, nor are they–as the song suggests–“friends of mine.” While beautifully colored, they are quite poisonous. The toxins on their skin can interfere with the nervous system leading to heart failure. I just love taking these silly self-portraits. They’re quirky, like my wife and me. Having finished our visit to the Tennessee Aquarium, I wanted to make my way across the Tennessee River to a riverboat that I had spied earlier. I have always wanted to ride an authentic riverboat. Several years ago while on a trip to Missouri I almost took a ride on a riverboat on the Mississippi, but fortunes turned against me and the opportunity slipped away. So I thought maybe I would have the opportunity to ride this one. I really had no idea what this boat was exactly–was it a museum, was it even an authentic riverboat?–but I knew it was a riverboat and I knew that it was in a river. That’s at least half the battle. So we made our way across Veterans Bridge and down to Coolidge Park where the boat seemed to be docked. Sadly, I was disappointed again. The Delta Queen is in fact a bonafide riverboat, but now it serves as a hotel, and an expensive one at that. The rooms are absolutely beautiful, but I wouldn’t be taking a cruise today. Maybe next time, because this baby does indeed sail and when all that sailing is done, you’ll want to curl up in a beautiful stateroom. Oh well, at least the dog was happy. He enjoyed the park. Something else I would have enjoyed seeing was the Chattanooga Choo Choo, but as I have since found out, there isn’t actually a choo choo to see per se. Back in 1858, the Chattanooga Union Station (called the Terminal Station) was built here and it served the Southern Railroad all that way up until 1970 when it was finally shut down completely. Two years later, in 1972, the Terminal Station was purchased and converted into a hotel and a museum and renamed the Chattanooga Choo Choo after the song which was recorded in 1941 by Glenn Miller. You can see lots and lots of examples of antique steam locomotives, but there is no actual “Chattanooga Choo Choo.” Ya learn something new everyday. The Terminal Brewhouse is as close as I got to the Chattanooga Choo Choo. It’s a restaurant and bar just across the street from the Chattanooga Choo Choo hotel. The next morning, since I am a total Civil War and caving enthusiast and my wife has shown great interest in the same, we decided to head up Lookout Mountain. At the very top of this mountain (uh hem, molehill) lays the high ground that both Confederate and Union forces held at one point or another during the Battle of Chattanooga. The Battle of Chattanooga and its accompanying battlefields are much larger than just the portion that we visited on Lookout Mountain. But the Lookout Mountain battlefield is one of the most impressive that I have visited since moving to the molehills. The drive up the mountain is absolutely beautiful and once you make it to the top, it is astonishing to see that the “high ground” here really means high ground. As has been my experience so far with Civil War battlefields, the “high ground” usually just means a small rise or hill above a flat, wide-open battlefield. Not here. This is a mountain (in southern terms, anyhow) and it provides an army the perfect opportunity to shell an enemy below without any real encumbrance. A portion of the Lookout Mountain battlefield now sits within Point Park. It’s not the Rocky Mountains, but nevertheless, what a view! That’s the Tennessee River down below; the same river that the Delta Queen sails on. A perfect position to rain shot and shell down on any advancing army. Looking down on Lookout Valley. Such a beautiful place for such a terrible event. My wife and “child” amongst autumn leaves. This is what makes me happy. We just laugh and laugh and laugh at this photo. He looks like the confused old man who accidentally wanders into your picture and has no idea what’s happening around him. By the time we had finished touring Point Park, it was cold and starting to get dark. Is there a better time to visit a cave, which also just so happens to be cold and dark? If you use the term “spelunking” around a caver, expect heavy sighs and eye rolling. One day, I will introduce Taryn to the real thing. But when a person has never really explored a cave, that person needs to be introduced to the experience slowly. One of the best ways to start is by taking a “wild tour” in a tourist cave. A wild tour gets a little more intense and a little dirtier than your standard stroll on the manicured pathways complete with hand grips and stairs in a typical tourist cave. On most wild tours, you get to experience wearing a caving helmet with a head lamp as your only light source. You’ll probably be wearing knee pads to protect your knees from the rocks which you’ll be scrambling over. And you’ll certainly be wearing clothing more appropriate to a wild tour: hiking boots, ratty jeans, and a sweatshirt. It’s more like the real thing. And it’s a good way to test your mettle before really going out and trying the real thing. But we wouldn’t be doing a wild tour this go around. Maybe next time. That tower like building is a great place to hang out and see the lights of Chattanooga. Taryn is all of five feet tall. As a result, it can be a challenge to fit both of our faces into a picture. As such, these corny pictures usually lead to copious amounts of laughter. We drove a few miles down Lookout Mountain to the parking lot for Ruby Falls Cave and prepared to hook up an IV line to our bank account. Cave tours are not inexpensive; as campy as they tend to be. I’m surprised that they can charge as much as they do. Tourists will pay just about anything to be able to go home and tell everybody that they got to go “spelunking” (eye roll). Ruby Falls is no exception on both the campiness and cost factors. The best part? Our tour guide whose arm was in a sling! Ruby Falls has the unique distinction of possessing elevator access. It’s just a quick ride down the shaft, versus a long walk to the cave’s entrance (like the Mark Twain Cave in Hannibal, Missouri). I’ve only seen an elevator one other time, at Carlsbad Caverns in Carlsbad, New Mexico. Once the elevator doors open inside the cave, you get to meet your guide who stays underground for their entire shift cycling through groups. Ruby Falls has this down to a science. Frankly they transition new groups into the cave very quickly and efficiently. Most caves I’ve visited require a long wait in a gift shop (not by accident, I’m sure) before the tour leaves. Not at Ruby Falls. We bought our tickets and were advised to visit the restroom, since, well, you can’t do that inside the cave and were then whisked into the elevator and down into the cave. From ticket purchase to entering the cave took all of about ten minutes. After meeting our guide, we all gathered in a fairly large room and were shown a cheesy video describing some of the cave’s history and the restrictions. For example, in a cave you never, ever touch a formation. Seriously. In some places, it’s against the law. Doing so will leave skin oil on that formation effectively “killing” it. The oil keeps minerals from building up and thus the formation is “dead” since it can no longer grow. Tourists have difficulty understanding the incredible importance of this rule and so most caves don’t take tourists into rooms with amazing formations that are within easy reach. Most formations you see are either already “dead” or are safely behind a barrier. It irritates me to no end when I see people touching these formations. There’s a good reason for these rules. Our guide asked us if we had any questions, and one guy spoke up, asking the question we all wanted an answer to: “What happened to your arm?” Her arm was in a sling, you see. Turns out that a previous customer had become irritated for one reason or another several weeks earlier and had punched this poor woman square in the face, causing her to fall and break her arm. He was arrested. She went to a hospital. Via the elevator. And an ambulance. Our damaged tour guide, along with the elevator, made this cave tour one of the more unique I’ve been on. I was hardly able to contain myself. As caves go, Ruby Falls Cave is pretty basic. If you’ve never been to a cave before, you’ll be impressed, but if you’ve been to the enormous Mammoth Cave in Cave City, Kentucky or the incredibly beautifully decorated Fairy Caves in Glenwood Springs, Colorado or the previously mentioned Carlsbad Caverns which boasts of some of the largest formations in the world, then Ruby Falls will be a bit of a let down in terms of formations. The color outside the cave was more impressive than the color inside the cave. But Ruby Falls Cave’s claim to fame isn’t formations. What makes Ruby Falls Cave worth taking the time to see is, well…Ruby Falls. And here is the reason that people visit Ruby Falls Cave. No, kids, the falls do not actually appear in this color. They are enhanced–significantly–by colored lights. Take a twenty second look at Ruby Falls. The falls are genuinely very cool and seeing them is worth the price of admission. The last time I saw a waterfall inside a cave, I was caving for real in Fulford Cave near Glenwood Springs, Colorado. No guide, no lights drilled into the sides of the wall, no perfect walkway, no hand rails and certainly no stairs. Just a hard hat with a lamp, a flashlight as a backup and several light sticks as a secondary backup. Good thing too since both my primary light source and my secondary light source failed inside the cave. The difference is that in Fulford Cave, my caving companion and I had to scamper up the waterfall in order to proceed into the next room. Yes. We climbed up a waterfall. You haven’t lived until you’ve had a real caving experience. If you’re ever in Chattanooga, take a drive up Lookout Mountain and visit Ruby Falls. The falls make all the corniness worth enduring. And then it was time to go home. We held hands as we strolled to the car in pitch black darkness on Lookout Mountain and began the relatively short drive back to Nashville. We had a great time, and I finally got to see a little bit of Chattanooga, something my wife had been trying to get me to do almost since she met me. It was the first time since we met (other than our honeymoon) that I had a full weekend to spend with her. While the circumstances following the events that lead to that opportunity have been difficult, the time with her was wonderful. I’ll take the circumstances; time is too precious to waste. We will find ourselves back in Chattanooga one day soon. Maybe we will even move there. It’s a great little town and a beautiful place and I enjoy it far more than Nashville. There’s more exploring to be done there and there’s a riverboat with my name on it. Thank you for a great birthday, baby. You rock my world. This entry was posted in Travel and tagged Battle, Cave, Chattanooga, Chattanooga Choo Choo, Civil War, Falls, Lookout, Mountain, Ruby, Ruby Falls Cave, Tennessee Aquarium, Terminal House by Kirk Peterson. Bookmark the permalink. I’ve just begun reading your new post, enjoying it as much as all the previous tales you’re shared with us. I had reached the end of the shark tank adventures and had to pause to clear up what is evidently a misunderstanding on your part. Although you said that being born is no small feat, your feet were, in fact, quite small when you were born! Great to read this article, too. My fiance’ says I should see Chattanooga at least once before I am determined to hate Tennessee forever. Lol. Congrats on your marriage! Great pics! Thank you! Appreciate your kind comments! Yes Chattanooga is really quite a nice place. If I end up staying in Tennessee, I’ve mentioned that I would like to move to Chattanooga or possibly Knoxville. The eastern part of the state is quite a bit different than the middle portion.